OS X users are blessed (or is it cursed?) with a plethora of choices for our Web browsing needs. Safari, of course, is the dominant browser, followed by Firefox, and then any of a number of others, including OmniWeb, Camino, Opera, and the venerable iCab (not listed in any sort of order). In the course of my job over the last few years, I’ve had the opportunity to use all of these browsers, and many more—too many to count, in fact. While they are all excellent browsers, over time I’ve settled on Firefox as my personal favorite (with Safari as a close second). However, when people would ask me why I preferred Firefox to Safari, I never really had a good answer. The biggest apparent reason is Firefox’s support for add-ons that can greatly extend the browser’s power, and that’s certainly something. On the other hand, using Firefox means putting up with a somewhat non-Mac-like user experience—everything from buttons to fonts to menu behavior is just a bit different than in most any other Mac app. Given I could have a perfectly Mac-like user experience by simply switching to Safari, why haven’t I done just that? I used to think it was the add-ons that kept me on Firefox, but while tackling an upgrade to Geeklog (the content engine that powers Mac OS X Hints) that reqiured testing multiple pages in many browsers, I realized just why I prefer Firefox: URL handling. More specifically, it’s how Firefox handles partial URLs typed into the URL entry bar. As I’ve noted in previous posts here, I’m a keyboard addict; if I could get away with not touching the mouse all day, I’d be a very happy Mac user. When using a browser, that means I’m more likely to type a URL into the URL entry bar than I am to use a bookmark to reach that same site, as that would require using the mouse (or a lot of typing to activate and navigate through the Bookmarks menu). While both Safari and Firefox will auto-complete “known” URLs as you type them, they go about things very differently—and for my workflow, Firefox does it in a much more powerful way. To demonstrate the differences, consider the Mac OS X Hints blog page here on Macworld.com, which I access many times each day. In Firefox, I can load this page by simply typing a portion of any word in the URL—weblogs, for instance. As soon as I start typing, Firefox starts presenting matches based on my browsing history; I can then easily select the correct URL using the arrow keys and then pressing Return to open the selected URL. Safari, on the other hand, doesn’t show anything when I type weblogs, as seen in the image at right. 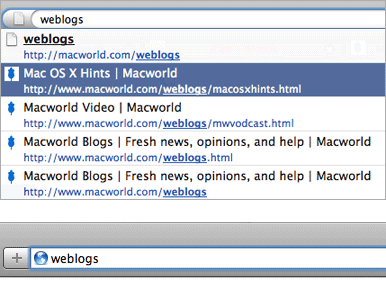 Instead, to use URL completion in Safari, I have to start by typing the root of the site (macworld, in this example). I’ll then see a list of pages I’ve visited before, and can select one using the arrow keys and the Return key. If I only ever accessed that one page here at Macworld, this wouldn’t be a big hassle. But that’s not the case; I also visit the reviews, iPhone apps, iPhone, Mac 911, and Mac Gems pages, amongst others. In Safari, I must access each of those by typing macworld, then either looking at the list, or using the forward arrow to move to the end of the URL and type the next bit of the path. In Firefox, I simply type part of the URL (reviews for the Reviews page, macgem for Mac Gems, etc. ), and then press the down arrow and the Return key to open the proper page. It’s a little thing, but over the course of a day, this trick saves me a ton of typing, and makes Firefox feel notably faster than Safari. I know there are ways (via plug-ins) to add keyword-based shortcuts to Safari, but then I’d still have to go through the trouble of creating and remembering a shortcut for those pages I visit often. With Firefox, I don’t have to remember anything other than some portion of the URL. Firefox isn’t for everyone, but finally, I can at least clearly identify the main reason I prefer it to Safari. That doesn’t mean Safari’s a bad browser, of course—it’s actually an amazing product. But for the way I use the Web, Firefox’s URL handling (along with its add-ons) makes it my preferred browser.